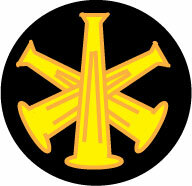 The "Bugle" or Speaking Trumpet is a traditional symbol of rank in the fire service. Now you can own one for a reasobable price. It is THE perfect gift for a new officer. Fire department units are usually divided into a few basic categories. If the Station Captain is off duty for some reason, (vacation, illness etc.) the Lieutenant will often move up and take his place. He would be referred to as an “Acting Captain” for the day. In some cases, a non-officer, such as a driver would move up to “Acting Lt.” if that officer is either off or working in another capacity. Battalion- This is usually made up of about 5 stations and the companies that are quartered there. But this is one of those things that vary greatly from city to city. This unit of vehicles and personnel is usually supervised by a Battalion Chief. Some smaller cities will have only one “Bat Chief” on duty over the entire city. He will serve as the only chief officer on duty on nights and weekends. Some cities assign this rank to chiefs over a particular section. For example a Battalion chief may be in charge of training or communications. This has many variations and definitions depending upon the city. As you can see the application of the term “Chief” can be a little vague. Each city can be slightly different it comes to how it divides up it’s resources for supervisor control. You might want to think of it this way. Driver - Also known as “Engineer”, “Chauffeur”, “Fire Equipment Operator” (FEO) and other terms. In most departments this is the person who drives the vehicle and operates the pump or aerial. He is a specialist who knows everything about that piece of apparatus. Note: In some northern cities the driver and the pump operator / engineer may be two different people. Note: Some departments might have a rank of "Second Driver" or "Sub-Driver". This is a person designated to drive when the regular driver is off for some reason. Departments without this rank will usually pay a firefighter driver pay or "out-of class" for the day. Lieutenant - (Lt.) - This is usually the officer over a single company. Depending upon the city he may be on an engine, truck, rescue company or whatever. There might be more than one assigned to a station. Some cities will not have lieutenants but will go from driver to captain in their rank structure. Captain - (Capt.) - This officer commands a single company but also is the ranking officer at a station that may have several companies. He may have one or more lieutenants working at the station with him. This officer is often the initial command at emergencies and can be called upon to fill in for the Battalion Chief during his or her absence. A captain may also be over a special section or function. Examples are: Dispatch, Training, EMS etc. Senior Captain - This is a somewhat rare rank designation. Some departments may have no Lieutenants, but instead have the ranks of "Captain" and "Senior Captain". Battalion Chief - (BC) - Operational supervisor over several companies. Often the highest ranking officer on duty on a 24 hours basis. (An exception to this occurs in the very large cities.) Can also be over a division of the department such as Training, Communications, etc. NOTE: In North Bay Ontario, and some other departments, this position is referred to as "Platoon Chief"
Deputy or Assistant Chief - In some departments this may be the same as a battalion chief. In other departments this is a staff chief. Please note: It is not uncommon at all for departments to simply not have lieutenants or to not have captains etc. A person may go directly to captain from driver or from lieutenant to battalion chief if a rank in between, does not exist in that department. They can also have sergeants or majors, depending upon the tradition of that departments. Oklahoma City FD might be a good example of a department with sergeants and majors. One might guess that this is designed to have a pay scale, or rank structure, that mirrors the police department. Some terminology and the rank structure in the fire service is generally accepted as something that came from the Civil War. Prior to the Civil War, U. S. fire departments were often run something like a business. Many early fire brigades were private organizations who were paid by insurance companies. There were chiefs, bosses, leaders and foremen and such. During the Civil War entire fire departments joined up as a unit. They became units like Infantry “Companies” etc. (FYI- Many of the elite Zouave brigades were made up of fire brigades.) The leaders were given rank and that rank or title survived the war. After the war some men were known as “Captain” for the rest of their lives and when they were replaced, the department got a new “Captain” for that company. There were also other influences on the rank structure of fire departments. Credit for the first "professional" fire brigade is given to Napoleon Bonaparte. As French emperor, he ordered that a division of the French army known as Sapeurs-Pompiers be used to protect Paris with 30 powerful manual fire pumps by 1800. We can presume that this organization had ranks. In fact, many military words, such as those for rank, come directly from Old French. (i.e. "Lieutenant" & "Captain") The very first, recorded, full time, fire brigade was in first or second century Rome. This consisted of approximately 7000 "Vigiles". The rank insignia for the fire service is a combination of traditional fire service icons and the common military symbol for such a rank. For many ranks you might see either insignia or both. A captain may have one type on his collar and another on his hat or helmet. In the early days, of North American fire departments, orders were given to the troops, by officers, through the use of a large brass device that resembles a megaphone. These were very ornate brass horns. They were commonly called “bugles” or speaking trumpets. The person with the bugle hanging from his neck or shoulder was easily identified as the person in charge. Officers became identified with these objects so a small pin in the shape of a bugle became a type of rank insignia for officers. The more “bugles on his collar” the higher the rank. An expression still used today. Many departments have adopted a less formal or less military style of uniform. This may be because of some new national standards on what clothing used for firefighting can be made from. Even "golf" style shirts or t-shirts that have been constructed and approved for firefighting, are relatively expensive. This may change as more uniform manufactures learn how to comply with these standards at lower costs, or budgets recover. Many departments have formal dress uniforms for ceremonies and staff officers will usually wear uniforms that have a more formal appearance. But because of recent budget crunches, some departments have suspended the purchasing of new dress uniforms. Some departments have the rank spelled out on some uniforms. 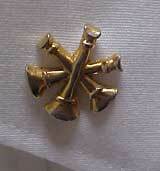 Others have sewn in rank insignia while others still use pin on brass. The number of variations are endless. Driver - May have no insignia or may have a simple Maltese Cross or something that looks like a steering wheel. They may also have simple “FD” or “FEO” or "Driver" collar brass. May have a single bar as in the military or may have a single “bugle” or both. The bar can be gold or silver. 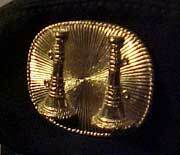 Bugle rank insignia can be mounted on a disk or can be just the bugles by themselves. May have two bars, just like the US military or may have two vertical bugles. Sometimes, by mistake, you may see a captain wearing two crossed bugles. The bars are often gold but can be silver in appearance. NOTE: While rare, it is possible to see ranks like "Sergeant" or "Major" in a fire department. Often this is the result of a PSO type of function where some members are also police officers, but it can be seen in departments that are strictly fire and rescue. These ranks usually only exist in the larger departments. Their rank insignia could be any combination of the above stars and bugles or can even be an eagle like a colonel’s rank insignia. Note: Some departments may refer to their on duty chief(s) as District, Deputy, or Assistant Chiefs. This person might even be called, "The Shift Commander" or "Platoon Chief". Most often these officers will be wearing bugles or stars. These will likely be wearing three or more of whatever it is. 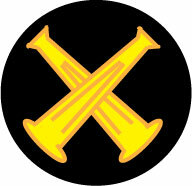 Chiefs often wear either FIVE STARS or FIVE BUGLES or both. 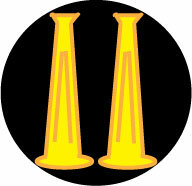 In order to be able to do this his lower chiefs must have some insignia that suggests it. If none of the people under him are wearing more than one star it might not be appropriate for him to have five. Departments try to divide up the stars and bugles so it makes sense. This is why battalion chiefs have such a huge variation in rank insignia. Sometimes a battalion chief is the second highest rank in the department. Sometimes it is the sixth highest rank. The number of bugles or stars often depends upon how far you are from the chief. While on the subject of uniforms we should mention that there is no "set in stone" standard for the color of helmets or what rank each color represents. Until the 1980's it was common for all firefighters to have black helmets. Only chiefs had a different color and that was white. 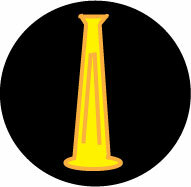 Officers would have an emblem, or stripe, on their black helmets. New helmet design gives us a choice of colors. Captains often have red helmets and Chiefs are usually white. A national consensus is emerging but some departments apparently are clinging to their own traditions. Some departments will have a color for lieutenants while others do not. You may find that EMS personnel have a specific color of helmet in some communities while in others they simply reflect the rank. In the western part of the U. S., officers will have red or white helmets while firefighters (the rank) will have yellow. As you go east you will find black as the more common color for firefighters. LA has yellow helmets. NY has black. Dallas has yellow for non-officers while Houston uses black for firefighters. Luckily you will often find a written out rank position or "bugles" on the helmet to give you a clue. Two Lt's helmets from the same department. (But in some departments black would signify the rank of firefighter. You may also find different styles of helmets within the same department. This may mean nothing. A department may decide to go to a different style of helmet as replacements are needed. Some departments allow members to purchase their own helmets. Even personally owned gear must comply with NFPA Standards. There are probably as many ways to set up an arson investigation division are there are opinions on what color fire apparatus should be. Some fire departments will have investigations as one of the things it does. A person can be assigned, or request transfer, to the branch that conducts investigations. You can be an officer at a station one day and an investigator the next. You may stay in that position for any number of time intervals. In some departments, it may be a position that is rotated after a period of years. In others, once you are in that position, you are expected to remain there for an extended period of time. You will also find fire departments who have turned over arson investigations to another agency. Fire investigators are USUALLY also police officers. That is to say they can investigate the CRIME of arson and arrest suspects. You will often see fire investigators carrying fire arms. Most communities have recognized that this is an important certification for the fire investigator. But there are exceptions. In many states you do not have to be a peace officer in order to be a certified investigator. In some situations or jurisdictions the investigator conducts the investigation of the crime and then gets the police to arrest the suspect. A few departments will have a completely separate division that is prevention, inspection, and investigation. When you hire on to the fire department you choose where you want to work by the application you submit and the test you take. If you are hired to be in firefighting and rescue, that is where you will be. If you are hired to be in prevention / investigation, you will never be fighting a fire. This is often called the “Fire Marshal’s Office” although it can be, and often is, known by other descriptive names. The Fire Chief and the Fire Marshal and the Fire Commissioner are usually very separate offices. The fire chief is usually under the fire commissioner. The fire marshal is usually under the fire chief. You would not have to look too hard to find exceptions to this. In a few communities the fire marshal may be the only paid person on the department. Everyone else, including the chief, are volunteers. In these communities the fire marshal conducts the investigations and, at least to some degree, oversees the firefighting and rescue operations. It is probably more common to not have a fire commissioner than it is to have one. The office of fire commissioner is usually only found in a few very large departments. This might be an appointed or elected position.